Giulietta and Romeo castles stand on the top of two hills, and after 600 years they still are the proud guardians of the territory of Montecchio Maggiore. The two castles, still divided by a feud, gave inspiration to Luigi da Porto to write the unforgettable story about the love between Romeo and Giulietta, which was afterwards to be made immortal by William Shakespeare. On May 1st of each year, to honor these ancient and stately manors, a medieval festival is held, where the castles return to the glories of the past as if they were still in the fifteenth century. It will be a step back in time, a unique experience for young and old. From 11 a.m. until nightfall you will be involved in shows and demonstrations. Opening the Festival, announced by drummers and flag-wavers, will be the parade with the families of the Montecchi and the Capuleti, the Lords of the two castles accompanied by their courts. Jugglers and acrobats will be everywhere to entertain you with games, jokes and tricks. The taverns will welcome you for refreshments and visiting the medieval market you will see all sorts of goods common for that period and learn ancient crafts. You can admire the falconers that will enchant children and adults with the evolution of their bird of prey and the fortune-tellers can read the future to the more daring. Within the walls of Romeo's Castle you can admire shows of flag-wavers, listen to old melodies played by minstrel and troubadours and enjoy elaborate dances of the nobles dressed in splendid garments. These entertainments will brighten up the wait for the appointment of Romeo and Giulietta, which will be the representatives of our city throughout the following year. You can also admire "The Priare" historic quarries from which the Vicenza stone was extracted for the construction of villas, bridges and churches. We are looking forward to welcome lots of you to live and enjoy a day in the Middle Ages. On 1st May, for the duration of the event, you can reach the Castelli area on foot or by shuttle bus. 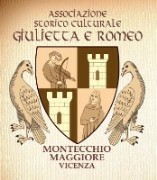 From 11,00 a.m till 19.00 p.m.
GRUPPO STORICO CULTURALE "GIULIETTA E ROMEO"
The medieval historical Group "Romeo and Giulietta", commonly known as "The boys of Faida" is a free association that re-enact the 15th century. The group was created in the year 2000, thanks to the enthusiasm of a group of friends of Montecchio Maggiore (VI). We are about 60 members, of all ages, volunteers and members of our free association. We want to be together and have fun in this medieval atmosphere. We did a carefully-prepared activity of historical reconstruction because the objective of the group concerns different field: from tourist promotion to the revaluation of historical sites, from didactic support in schools to the work of spreading the thought and life of late Middle Ages. From the year 2000 the group has had a steady growth, that is the result of a meticulous study of philological material like: paintings, treaties, manuscripts and so on. The period we have chosen to re-enact is the second part of the fifteenth century. To do it in the best way, we have focused our research efforts on materials that allow us to know with certainty the uses and traditions of that time in our territory and generally in the Veneto area. We are proud of what we achieved so far, but we know we can still improve. We will continue to work hard in this direction, supported by the spirit that accompanied us until now. The group meets monthly throughout the year. From September to June are held weekly training sessions to perfect and to heal, even with the help of experts, the various activities such as archery, drums, flag-waving and late medieval dances.